Did you ever think about planting for winter interest when you first started gardening? 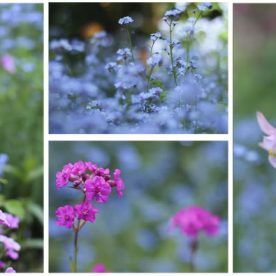 I have to confess that when I started my very first garden I was only interested in the colour that came from flowers. Then each autumn I would cut down all of the herbaceous plants …and what was I left with? 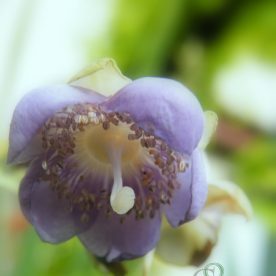 Not very much other than an evergreen hedge, a hellebore and the silhouette shape from a deciduous tree. 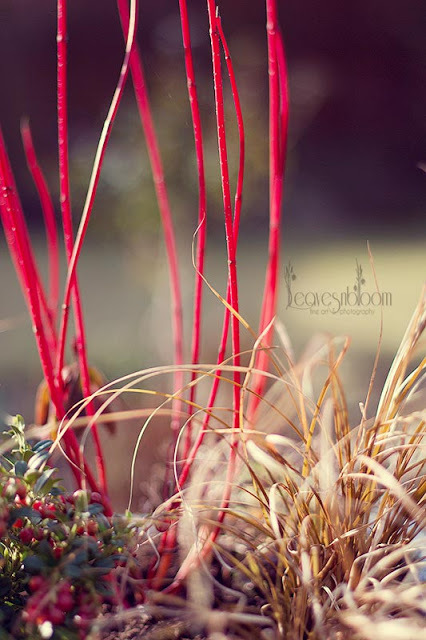 When the frosts arrived there were no dried seed heads to sparkle, no drama from colourful winter stems and the flower beds just lacked any winter definition. I’m glad to say that all of that changed after many years of gardening, study and loads of trial and error. Today I’m sharing three of my February winter interest favourites …all with one thing in common the colour red. 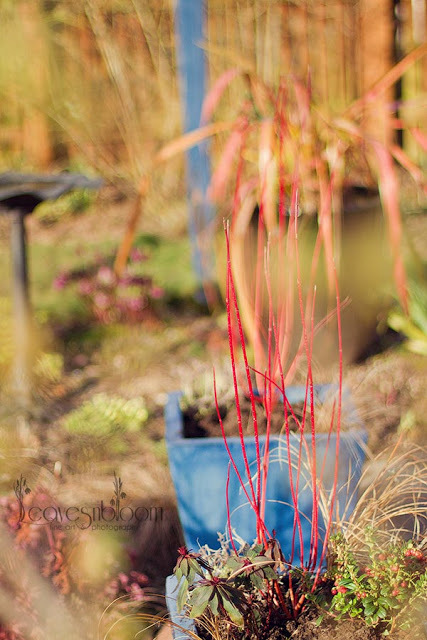 contrasting colours and shapes from the Cornus “Baton Rouge’ H4 and the carex grass. 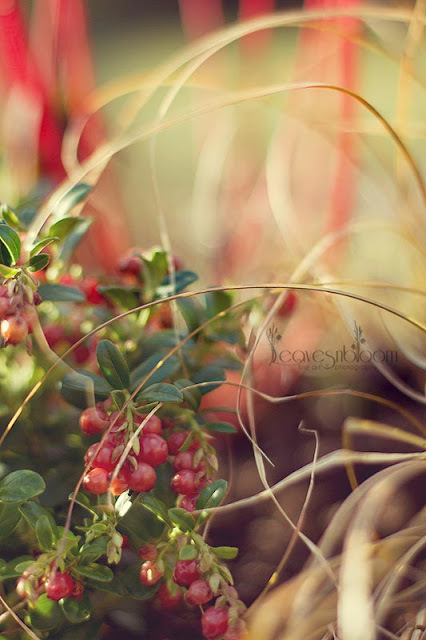 Their stems literally glow on a bright and sunny day and contrast so well with bronze coloured carex grass and the red cowberry Vaccinium vitis-idaea ‘Red Candy’. I’ve planted this one in a container for the winter months and added a few other plants from the garden. Their winter stems add drama especially when the backdrop is evergreen. They also contrast so well with a snowy winter wonderland or in my case near by a colourful hamamelis | witch hazel. Capturing the glow from the Cornus ‘Baton Rouge’ while in the background grows Hamamelis x intermedia ‘Pallida’ being back lit by the winter sunshine. If you do consider using a cornus in a container please don’t use a multi purpose compost but use a soil based compost that is suitable for the plants you’re growing. Prune cornus shrubs back hard in the spring. Then give a good feed. 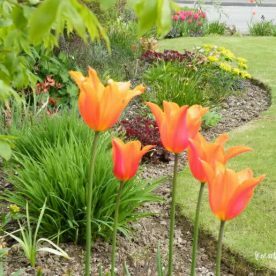 This encourages the new growth which produces the most vivid colours during the winter months. The Lingonberry or Cowberry is a very hardy evergreen. It is also low growing and compact. The plant can tolerate temperatures down to -40 °C though hates really hot summers. 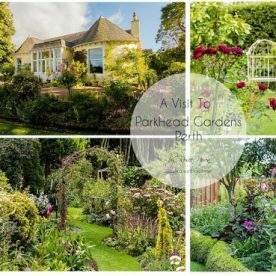 Hence it’s perfect for any Scottish garden! It’s berries are ornamental as they are much too bitter. It carpets the ground as it’s quite vigorous and produces white flowers in the late spring and red berries from early autumn right through the winter. It too is good for a container as long as you have added some ericaceous compost. Besides it loves the same moist conditions as the Cornus shrubs and likes to have some shade during the summer months. It’s probably best to grow more than one type of cowberry in the garden to be sure of getting those winter berries. Vaccinium vitis-idaea ‘Red Candy’ last week covered in snow. The birds don’t seem to like the berries so they give great winter interest throughout the season. Finally another plant that deserves a mention for winter interest is the evergreen acid loving plant Leucothoe fontanesiana ‘Rainbow’. It grows in a spot in the garden that only gets the morning sunlight. 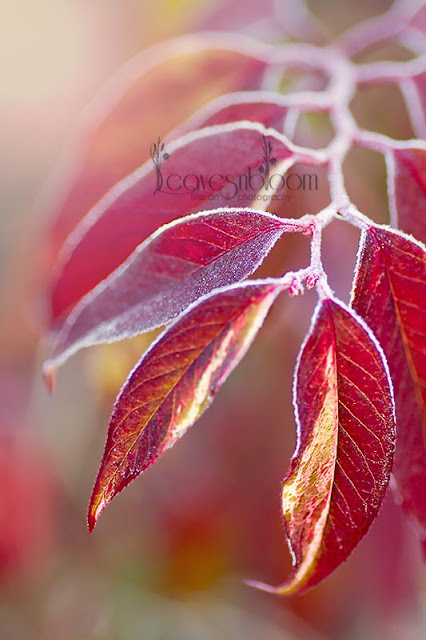 However it provides the border with lovely red leaves with a little touch of variegation during the winter months. Mine grows below a Cercis canadensis ‘Forest Pansy’ which takes over with the red/burgundy theme from late spring onwards. Leucothoe fontanesiana ‘Rainbow’ H5 covered in frost this week. The stems of the Leucothoe arch over gracefully. During the winter time it looks so attractive with a dusting of frost. It’s really only then that you’ll notice the really pretty leaf stalk pattern along its stem. Now I want a baton rouge! Red…it's always nice to see a shot of this colour in the garden even in depths of winter! I've both Cornus and Leucothoe growing in the garden and yes, the reds really do stand out, especially at this time of the year. I've a Coral Bark maple that also adds a bit too! Don't grow Vaccinium – I have seen it for sale but walk right past it. I need to give it more thought now! 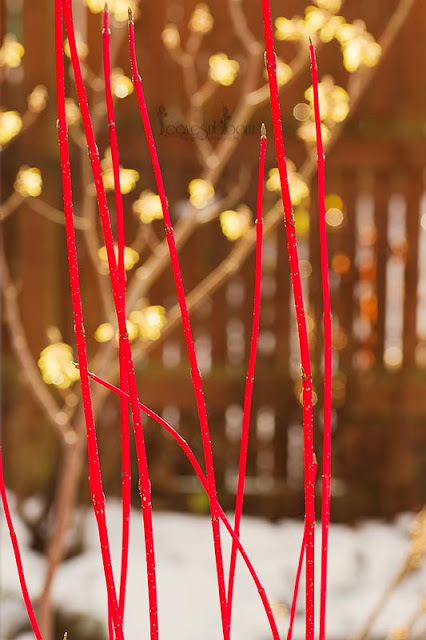 Lovely to see a hit of red in the winter months – I have a few berried treasures but really ought to try and introduce more winter plants to liven things up. 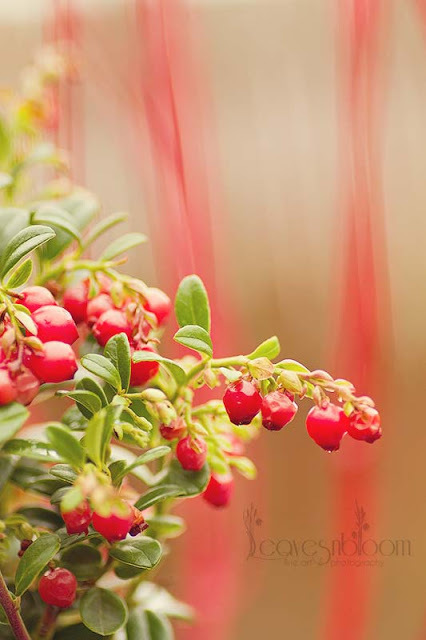 I remember the lingonberry bush in a neighbour's garden in Belfast that I used to pass….and how the shape of the berries facinated me….great post!!! That's a lovely trio of scarlet plany hussies! I've just planted a trio of dogwoods for winter interest in the back garden, including 'Midwinter Fire' which is new to me. I love the look of that Leucothoe fontanesiana 'Rainbow', but sadly I don't have acid soil. I am envious of your 'Forest Pansy', a favourite plant of mine, but which I have so far failed to find a space for here. 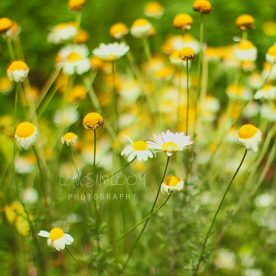 @Lucy Corrander at Loose and Leafy Oh I remember the day I said that too – only one just wasn't enough 🙂 They have really brought some great winter interest into the garden for me. @Larry I'm surprised you don't have room as you have such an extensive garden Larry 🙂 but I suppose to make any real winter interest impact you would need to have lots of them. @Mark and Gaz Yes guys especially when winter has left it's mark with a special coating of sparkling frost to contrast with the red. 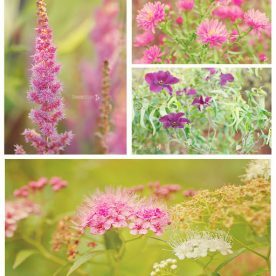 @elaine rickett I started planting my garden in Autumn over a decade ago and since most GC's only sell what is looking good for that particular time of year it made it easier to pick out the winter interest plants. 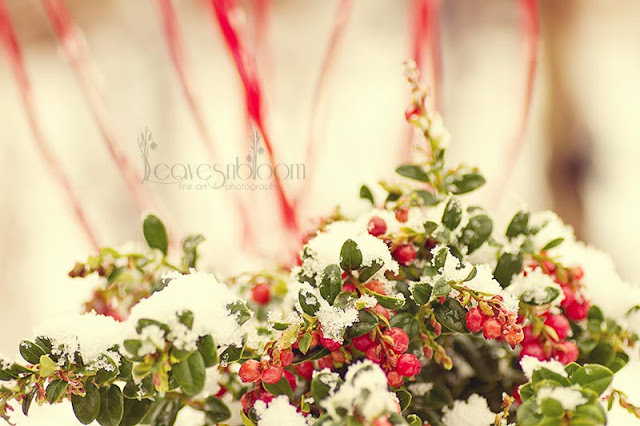 @Gerry Snape They certainly are very pretty winter shrubs as those berries just seem to cling on for so long. @Janet/Plantaliscious My forest pansy struggles to grow up here in Perthshire for me. It's always the last to break into leaf and I always wonder if it's still alive. Mid winter fire gets a little bit of die back on the stems but up until Baton Rouge came into the garden it was my favourite cornus. Oh my, the Leucothoe is lovely! I never thought to plant it, but it will be on my "potential" list now. I have, however, always enjoyed the burgundy glow of the Dogwoods, especially this time of year! Wonderful post! Cornus are such lovely shrubs and very hardy. The one in my garden, C. alba spends most of its life buried in snow.